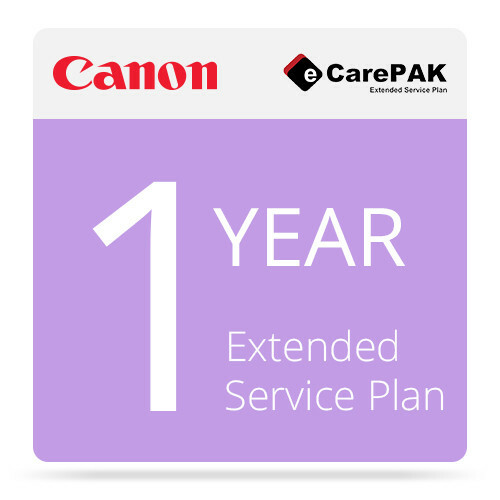 Keep your valuable equipment protected with the eCarePAK Extended Service Plan from Canon, available here for the imagePROGRAF iPF785 printer. This service extension goes into effect on the date that your original warranty expires, giving you an additional one year of support for your product. Offered with the plan is toll-free telephone support available during most U.S. business hours. You must first attempt to troubleshoot the malfunction with the technical support team, which can then choose to repair or exchange your product at their discretion. Services are provided at no additional cost, including genuine parts and labor and replacement units. Consumable items are not covered by the plan, and replacement equipment is shipped on an expedited basis and usually arrives by the next business day. Once purchased, you must register the service plan online and keep copies of relevant documents such as the hardware sales receipt and the eCarePAK welcome letter. These actions are required in order to obtain service. If you happen to sell your product, coverage can be transferred to the buyer in a one-time process so they can continue to receive the manufacturer's service for the rest of the term. Toll-free telephone support, usually available Monday through Friday from 8 AM to 8PM E.T.